Raima is using Smore newsletters to spread the word online. 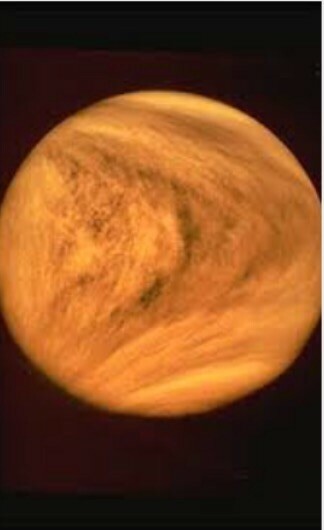 We can't see surface of Venus because it's covered with thick clouds. Space missions to Venus have showed us that it's surface is covered with Craters,volcanoes,mountains and big lava plains. The surface of Venus is not where you'd like to be,with temperatures that can Melt lead,an atmosphere so thick it would crush you and clouds of sulfuric that smells like Rotten eggs to top it off! 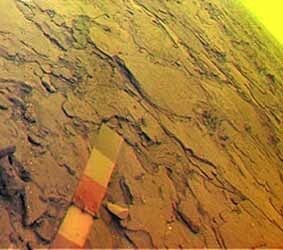 The Magellan Mission in the early 1990s mapped 98 percent of the surface of Venus. 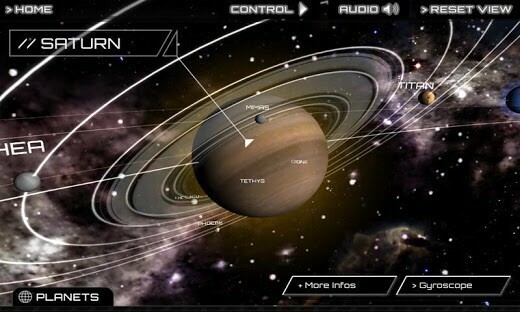 More than 40 spacescraft have explored Venus. The atmosphere of Venus is very hot and thick. You would not survive a visit to the surface of the planet-You couldn't breathe the air,you would be crushed by the enormous weight of the atmosphere and you would burn up on surface in extremely high temperature. 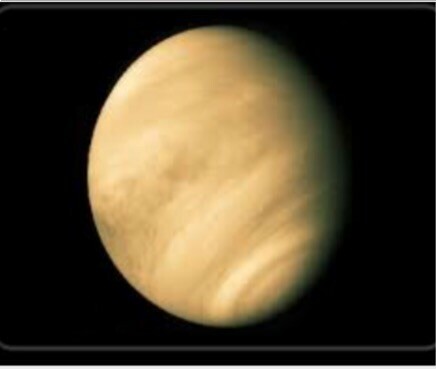 The atmosphere of Venus is made up mainly of Carbon Dioxide. The atmosphere traps the small amount of energy from the sun that reach the surface along. Venus's thick and toxic atmosphere made up of also Nitrogen(N2) with clouds of sulfuric acid (H2SO4) droplets. 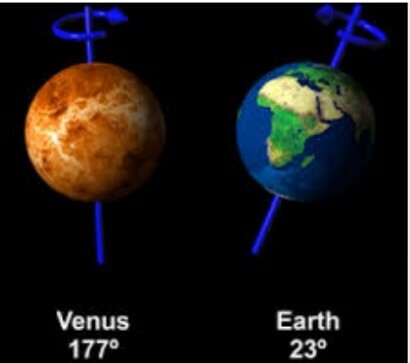 One day on Venus lasts as long as 243 on earth days(the time it takes for Venus to rotate and spin once)Venus makes a complete orbit around the sun(a year in Venusian time)in 225 earth days. There are no rings around Venus. Venus spins backward (retrograde rotation) when compared to the other planets.This means the sun rises on West on Venus and sets in East. 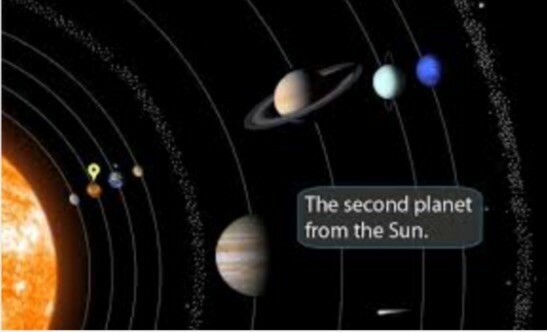 Venus spins slowly in the opposite direction of all the other planets. Venus's day is about 117 earth days long. 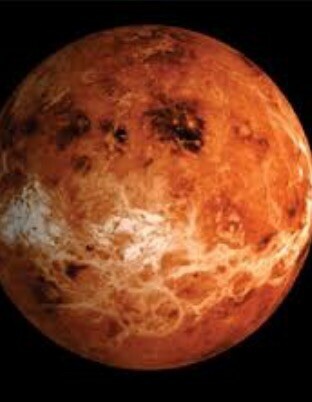 Venus is a rocky planet also known as a terrestrial planet. Venus's solid surface is a crated with volcanic landscape. No evidence for life has been found on Venus. 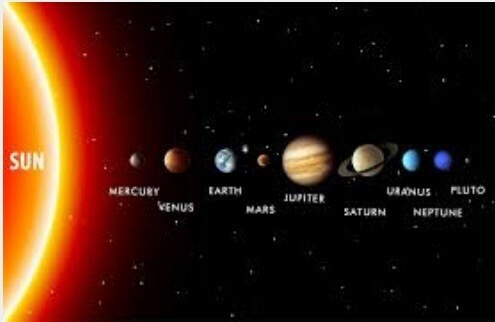 The planets extreme high temperatures of almost 480 degrees ( 900 degrees Fahrenheit) make it seem unlikely for life as we know it. The corrosive chemistry and dense moving atmosphere cause significant weathering and erosion. 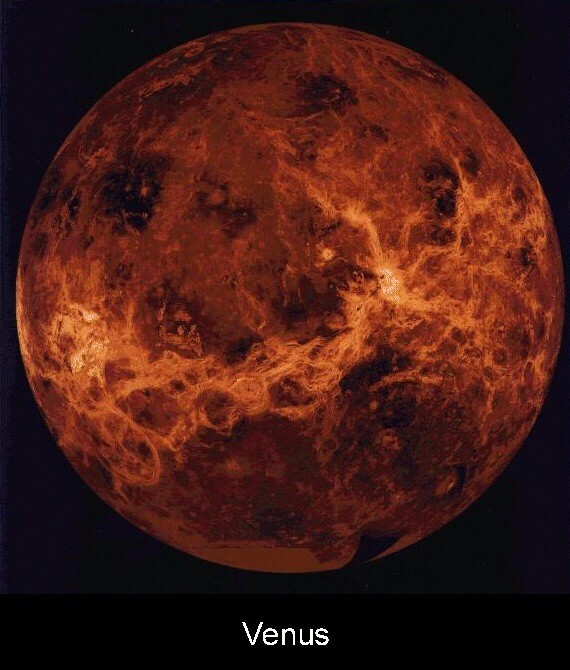 Venus has an iron core that is approximately 3,000 kilometers in radius. 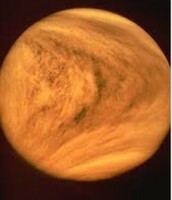 Venus has no global magnetic field though it's core iron content is similar the earth's. Venus rotates too slowly to generate the type of magnetic field that earth has. Venus is one of the brightest object in the sky,it is always found near the sun. Like Mercury,Venus can be seen periodically passing across the face of the sun. these "transits" of Venus occurs in pairs with more than a century separating each pair. Since the telescope was invented the,transits were observed in 1631,1639;1761,1769; and 1872; 1882. 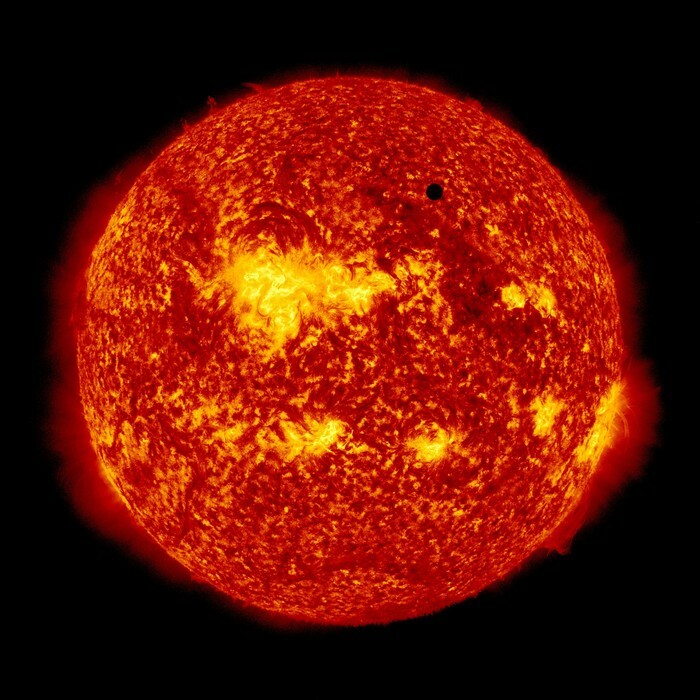 On June 8,2004 astronomers worldwide saw the tiny dot of Venus crawl across the sun; the second in this pair of early 21st-century transit occurs June 6,2012. Name came from the roman goddesses of love and beauty. Density=5.24 g/cm3 (0.95 of earth's). 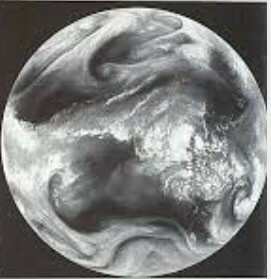 Atmosphere primary component = carbon dioxide. Temperature at surface 470 degrees C (880 degrees F). mean distance from the Sun= 108.21 million Km. Dunbar, Brian. "The Planet Venus." NASA. NASA, 03 Mar. 2004. Web. 30 Apr. 2015. "Venus: Kids." Solar System Exploration. N.p., n.d. Web. 30 Apr. 2015. "Venus: Overview." Solar System Exploration. N.p., n.d. Web. 30 Apr. 2015. Landau, Elaine. Venus. New York: Children's, 2008. Web.2015. N.P,,N.D. "The Planet Venus." NASA. NASA, 03 Mar. 2004. Web. 30 Apr. 2015.